This year First Fruits of Zion, in association with our new 12-21 initiative, sent a delegation of our own to attend, connect, and meet other young Messianic believers. 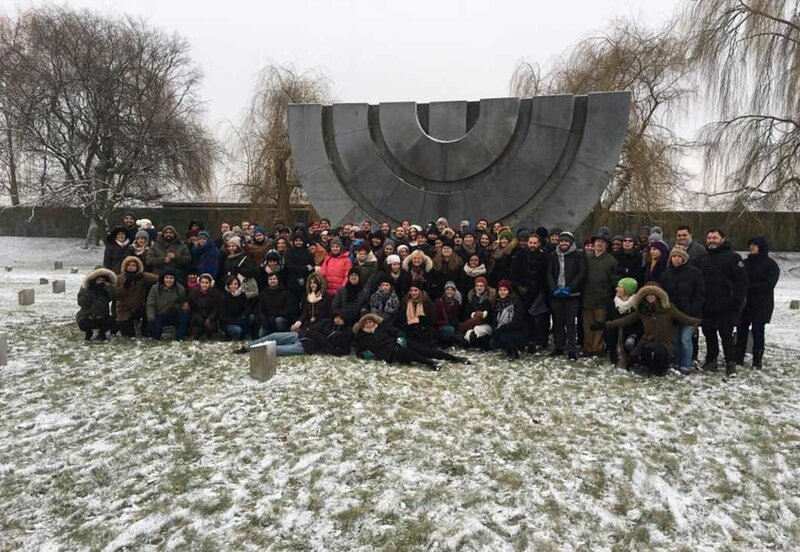 Delegates from the Prague Muchan Conference standing in front of the Menorah Monument at the Jewish Cemetery in Terezin. Lawrence and Louise Hirsch are from Australia and are some of the founders and visionaries of a Messianic conference for young people that takes place in various major cities in Europe. In the founding year of the conference, Lawrence and Louise approached Chosen People Ministries with the idea. Since then the Hirschs, the Muchan Team, and Chosen People Ministries host the international conference called “Muchan” (which means “Ready” in Hebrew) every two years. 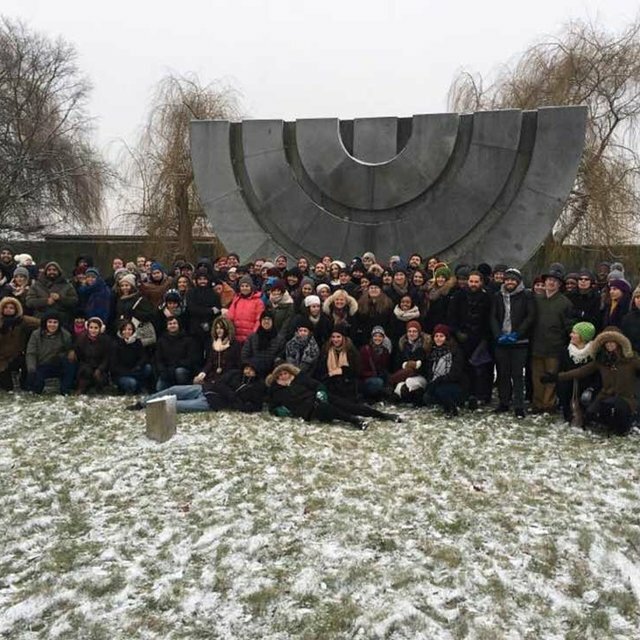 The event is solely for individuals between the ages of 18-35, and every time it occurs, it is in a different major European city with a rich Jewish history. The Muchan committee has done a fantastic job with combining the adventure of travel and the importance of social connection in a brilliant, fun conference. This year First Fruits of Zion, in association with the new 12-21 initiative and the Bram Center, sent a delegation of our own to attend, connect, and meet other young Messianic believers from around the world. Countries represented were: Israel, Australia, Canada, the United States, the United Kingdom, Austria, Germany, Russia, Poland, New Zealand, and others. During the one week conference, we attended the sessions, connected with and met many new friends and further cultivated relationships with older friends. The structure of the conference was perfect in that it catered to all preferences and styles. Those who enjoy praise and worship in English and in Hebrew, as well as those who love liturgical prayer, all found something they loved and appreciated in the sessions. Both our minds and hearts were engaged as we learned about the history of Jewish Enlightenment from the 1800s, which led to the birth of Messianic Judaism taught by Dr. Alan Shore, an engaging and brilliant mind. We learned more about Yeshua’s message of love and grace from Israeli believer and congregational leader Noam Hendren. Perhaps what was the most encouraging thing about attending Muchan was the leaders' heart to teach Jewish identity and education. The sessions taught by Dr. Alan Shore were particularly good as they gave us an in-depth look into Jewish history. He received many standing ovations as he hit issues such as Jewish practice, community participation, and identity head on. In addition to the teaching and worship time we also took daily trips into the beautiful city of Prague, which holds one of Europe's oldest Jewish communities. The city was filled with wonder, history, and a strong Jewish community. We also visited Terezin concentration camp, which helped solidify the importance of Jewish identity. It seems that often Messianic Judaism can focus on the things that divide us, but at Muchan what united us was very prevalent: love for Messiah Yeshua and his word. We saw this by the many young individuals that represented various organizations such as Jews for Jesus, Chosen People, Celebrate Messiah Congregation in Australia, UMJC and MJAA members, Metro Moses, Fruits Fruits of Zion, and a variety of others. While we all have different theological paradigms, there was a tremendous atmosphere of unity as we all became close friends or strengthened other friendships. While we were there it was very clear that the message of First Fruits of Zion resonates with many young people from across the movement. There is a great need for community, education, discipleship, and raising up the next generation with whom many identified and acknowledged the need. We were encouraged to be around other young believers who were serious about their faith and practice. How beautiful it is to be able to bless others and be blessed in return. This conference left us excited to see our generation continue to mature as the mantle of Messianic Jewish leadership is slowly and gradually being transferred onto our shoulders. At this conference we not only got to see the state of Messianic Judaism in America but the state of this universal movement all over the world. Our generation, who for the most part have been raised in Messianic Judaism, are hungry and ready for material that teaches on the depths of our faith. First Fruits of Zion has the materials and teachings ready for our generation. With the help of our FFOZ Friends we are beginning to get our materials into the hands of young Messianic believers who will take the message of Messiah and Torah to the future generations. Leaving Muchan left us incredibly encouraged for the future of Messianic Judaism. We have amazing people who deeply love God and his word in our movement. The future is very bright indeed.